So what performs better for Fortune 500s – photo or video? TrackMaven says that because Instagram’s video service is somewhat new, photos still appear to be doing better for brands versus video. 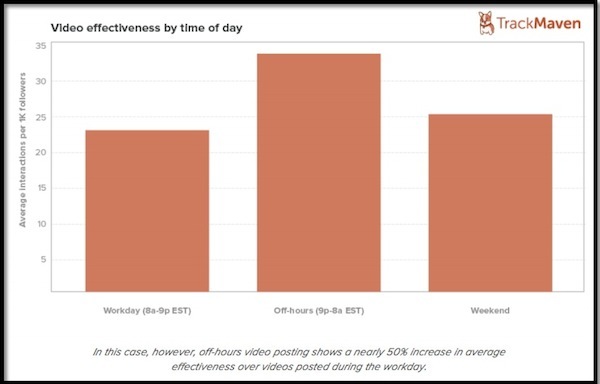 However, video content specifically performed better during off hours, suggesting “users are more likely to engage with videos when not at work, presumably because of the audio component of video,” TrackMaven said in its report. “Looking at the interactions (the sum of likes and comments) per 1,000 followers compared to the number of hashtags used, there is a strong correlation to the number of hashtags used and effectiveness up to 5 hashtags which has the highest average at 21.21 interactions per 1000 followers,” TrackMaven said in its report. Second, at 15 seconds long and the capability to upload videos that weren’t taken with the app, brands have the ability to enhance their videos more. Instagram functions as a highly visual platform; but taking it a step further by adding more videos to your account can give you an advantage with your followers. It’s often considered a social media faux pas to use more than two hashtags in a tweet; however, on Instagram, that rule can be thrown out the window. The data proves otherwise for bigger brands, showing that four to 11 hashtags can increase up to on average 77 interactions per Instagram post. When you’re incorporating hashtags into your Instagram post, try to integrate them seamlessly into your post caption as opposed to jumbling them all at the bottom. 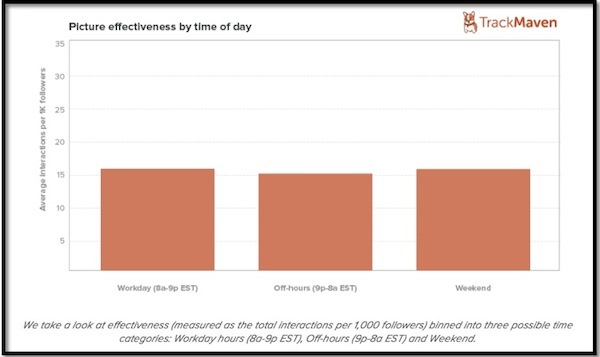 The Fortune 500 are posting the most during business hours; however, the interaction levels don’t point out a clear winner for the optimal time to post. People are rarely away from their phones, so posting at different times of the day ensures advantageous mobile strategies for different audience segments. Because there isn’t a finite time to post like on other social media outlets, brands can use this to their advantage to find what is right within their audience.